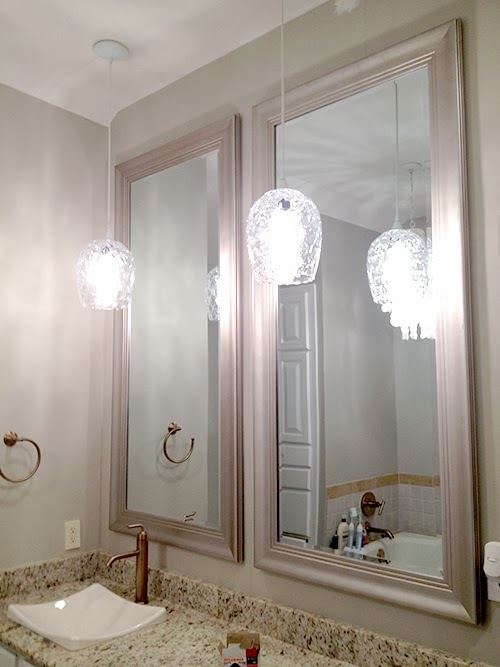 As part of our master bathroom makeover, we converted wall sconces over the mirror to pendant lights. Buying back that real estate above the mirror allowed us to take the floor mirrors all the way to the ceiling and gave us a more unique, designer look. Parts of this project were tricky (the electrical work), but other parts of it were relatively simple (creating the pendant lights). I originally wanted to just buy pendant lights instead of DIY-ing them, but I couldn't find any that I liked within our small budget. 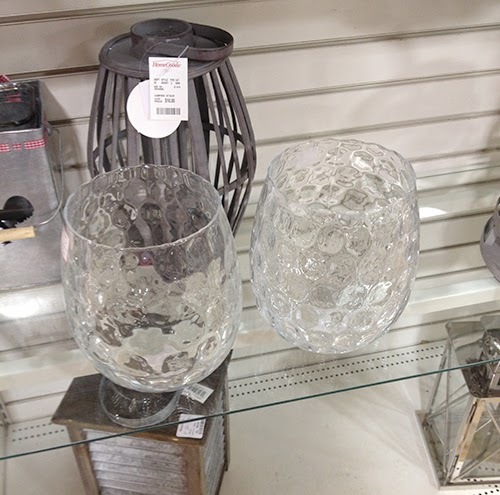 I really wanted a simple glass pendant to allow maximum light into the bathroom, and inspiration struck when I was walking through HomeGoods looking for something else. I knew I'd see other projects where people converted mason jars and other ordinary items to pendant lights, so why couldn't I do the same with glass vases? At $10 a pop, I thought these vases would be perfect. The circular honeycomb pattern would tie in nicely with the capiz chandelier over the bathtub, and the glass pattern would obscure the ugly light bulb inside (something I'm very particular about when I know the snazzy Edison-style light bulbs won't provide the functionality we need). Once I got the vases home, I tried to convince the husband that my plan was brilliant. He was skeptical. He needed proof that it would work. 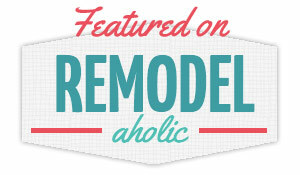 Then I found some awesome tutorials like this one about how to drill through glass by Mandi over at Vintage Revivals. I got a good laugh out of it when I realized she chose the exact same vases as me. Great minds think alike. She also has a thorough tutorial for how to create a custom pendant light, so I won't reinvent the wheel today. Her instructions were GREAT! 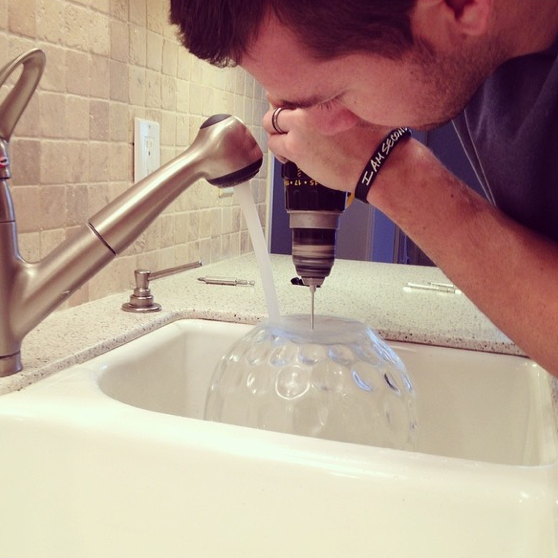 Once the holes were drilled in the bottom of the glass, it's as simple as attaching the light kits (we bought these.) Hello, custom pendant lights! Creating the lights was fairly easy, but relocating the electrical from the wall to the ceiling? Not quite so simple! Luckily for me, the husband has gotten very good at electrical work and was able to navigate this with just a little bit of extra elbow grease. We knew we needed to run the wiring from the wall to the ceiling. 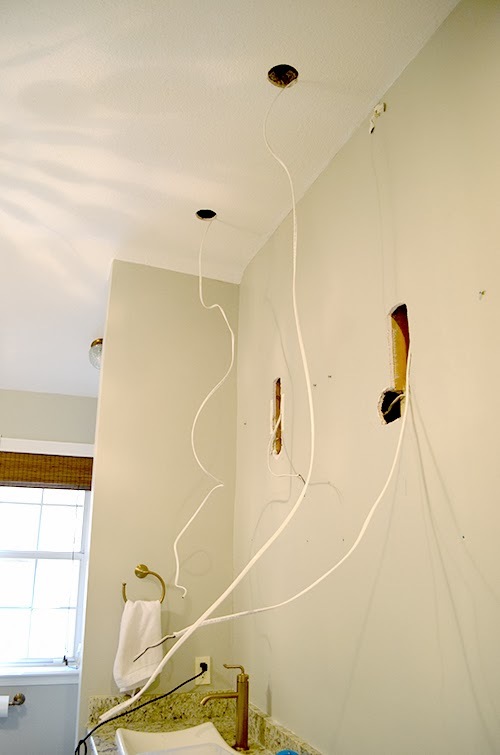 The first problem we faced was that there were two lateral wooden studs between the existing wiring and where we wanted to go. That meant we needed to drill holes through each stud so the wires could pass through, which is not very easy when you don't want to tear up the wall. Electricians have super long drill bits for problems like this, but we don't have one of those so we had to cut a bigger hole in the wall. 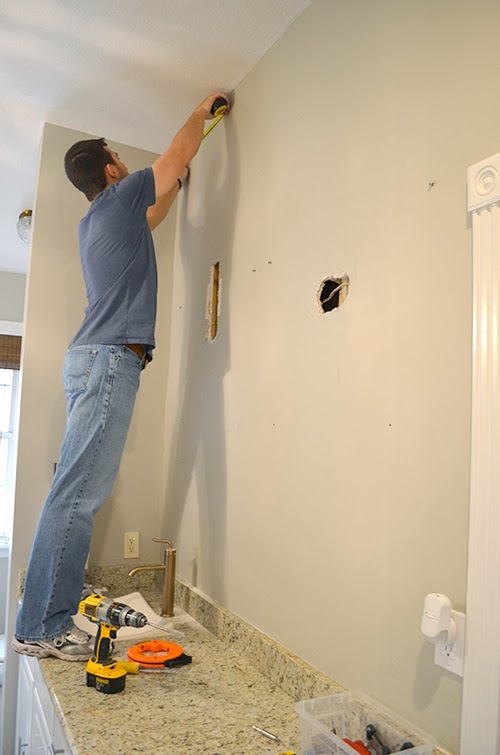 That allowed the husband to reach his arm in the wall with his drill and drill upward through the stud. 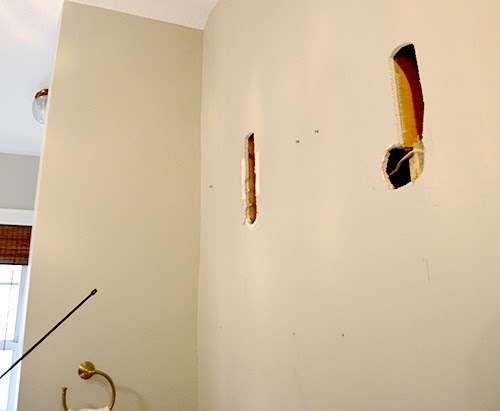 No worries, it was nothing a little spackle and paint touchup couldn't fix. Never a dull moment in DIY land! If you want a really fun marriage test, have your husband go up in the cramped, stuffy attic while you stay below. 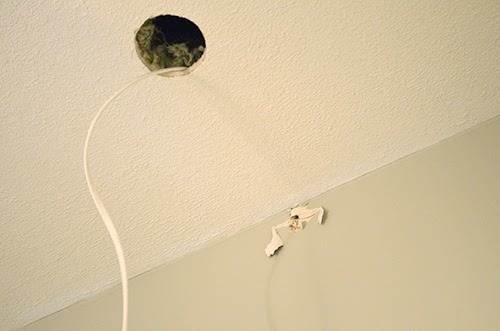 Work together to blindly run a wire through a tiny hole behind a wall while yelling instructions to one another through another tiny hole in the ceiling. 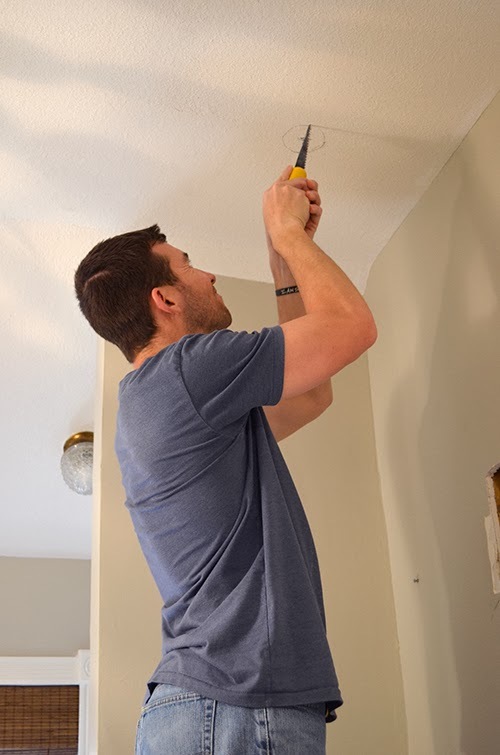 Make sure you don't stand directly below the ceiling hole because you'll surely get insulation in your eyes while he shuffles around up there. Then you'll be kind of mad at him for kicking insulation into your contact lenses while he'll be irritated that you didn't have the common sense not to stand under the hole and look up. Let's just say we both breathed a sigh of relief when the wires were safely where they needed to be. Marriage crisis averted, woohoo! Once the lights were up, we put in a normal, non-frosted lightbulb and turned the power back on. I was so excited for the big reveal. However, this was NOT what I was expecting! I got a little panicked at this point and had some fun conversations in my own head: "What was I thinking when I chose the honeycomb glass? This is completely nonfunctional! I'm not going to do my makeup with that lighting. He's going to kill me when he realizes he's done all this work and I don't even like the new lights!" Sensing my panic (and desperately trying to salvage the project), the husband suggested we try a frosted light bulb instead. Brilliant! Who knew it would make such a difference? It was such a relief when the new light bulb solved the problem. Thank goodness we didn't have to abandon all of the work we'd done. Phew. The vases were $10 and the pendant fitter was $16, so we spent about $26 per light. Not too shabby for a custom look! 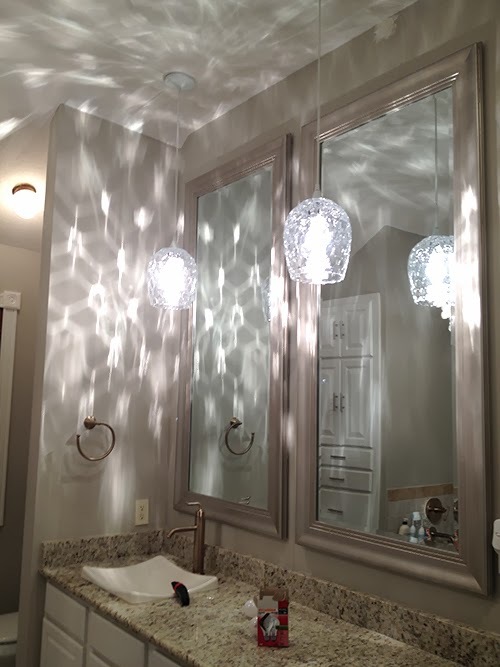 Since we splurged on the $80 floor mirrors above each sink, we were relieved to save some money with the lighting. 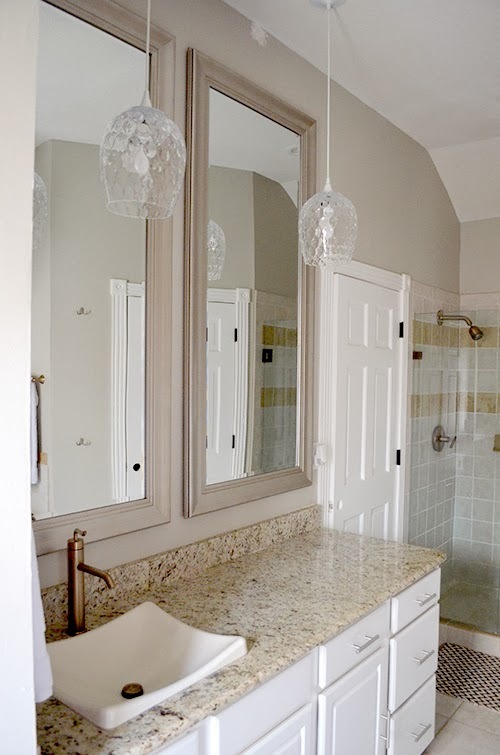 Well, that's a wrap for this bathroom makeover! 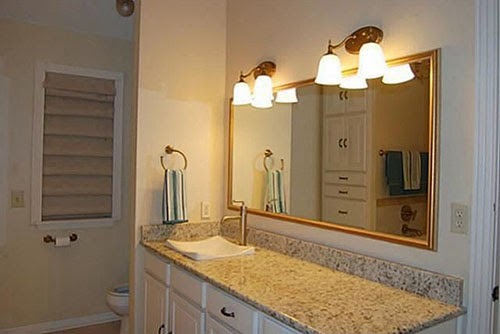 Unfortunately the guest bathroom is another story; that room needs a full overhaul. It hasn't been updated since the late 1980s. We're making plans and pricing options for that space as I type. Stay tuned!